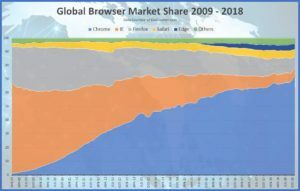 A few months ago Microsoft CEO Satya Nadala announced they are giving up on their own Edge browser engine because it cannot get past 5% market share, and replacing it will a Chromium (think Google Chrome) based product. Google made its engine, Chromium, open source (aka, public domain) in 2008 when it was new and Microsoft scoffed at it. Today Chrome and its Chromium based derivatives have 80% of the browser market and Microsoft stopped seeing logic in fighting this uphill battle. In mid-March 2019 Microsoft made their first rev of a Chromium based browser named Edge available to developers. So called Canaries we able to download daily updates of Edge Chromium builds and recently Microsoft expanded the offering to include a Dev Channel which is the previous weeks most stable update. The public Beta Channel, which will update every 6 weeks, will not be ready for a few more weeks. You can download any of these three versions of Microsoft Edge Chromium browser directly from Microsoft HERE. Updated every 6 weeks The Beta channel will be the most stable Microsoft Edge preview experience. It will be here soon, after we’ve had a chance to learn and improve in our other channels. Updated weekly Our dev builds are the best representation of our improvements in the past week. They have been tested by the Microsoft Edge team, and are generally more stable than Canary. Updated daily Want to see what we were working on yesterday? Canary will be released automatically almost every night to keep you up to date on our progress.